Hay House Radio is the world’s leading online talk radio for spirituality, empowerment, guided meditations, affirmations, alternative health and wellness featuring fresh, uplifting programs from some of the greatest experts and teachers in these fields. 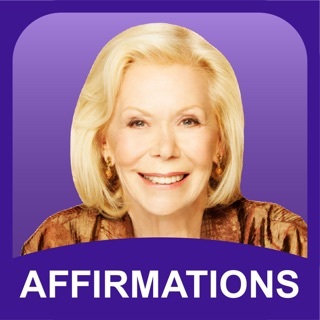 - Esther and Jerry Hicks: "Ask and It Is Given"
- Doreen Virtue: "Angel Therapy"
- John Holland: "Spirit Connections"
- Anita Moorjani: "Explore the Extraordinary"
- Kyle Gray: "Angel Club"
- Sonia Choquette: "The Sonia Choquette Show"
- Mona Lisa Schulz, M.D., Ph.D.: "Intuitive Health"
- And many more, including inspirational quotes, words of wisdom and self-improvement from Louise L. Hay! Upgrade to a Hay House Radio All-Access Pass and get unlimited access to thousands of Hay House Radio Archive episodes. 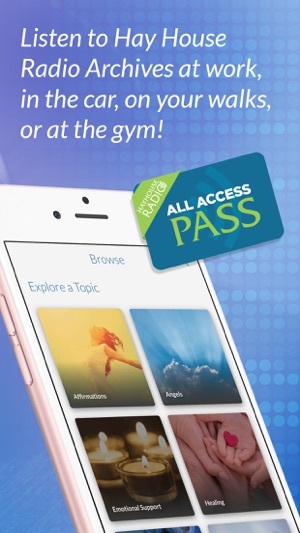 All-Access Pass monthly membership purchase now available within the app. Begin your journey of personal growth and healing now by listening to Hay House Radio! Updated the registration flow, and fixed a few small things along the way. Whenever I listen I feel more positive and that I’ve invested my time well! I always hear something that I didn’t know before or a new way of looking at things. I love listening to like minded people talking about what they are doing to help Mother Nature, things they are doing that makes a difference in their lives and the lives of others. Sometimes one may feel the problems of today are too big to make a difference yet listening to Hay House shows that everyone can have a positive effect even if it’s just holding a door for some who’s arms are full or walking with a walker. A simple smile or compliment can lift someone out of their sad state and change their day. 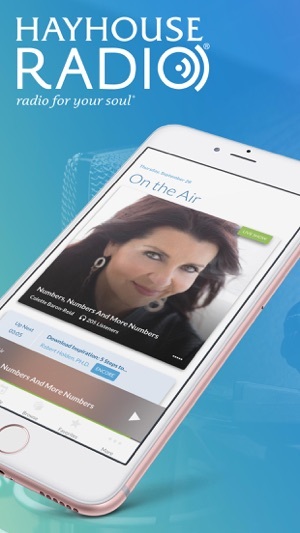 Hay House Radio and the thousands of archived shows they make available is the smartest way to invest your time and the pittance they charge for annual membership is worth every penny at twice the price. Thank you for continuing Louise’s life changing work! Blessings! There are some beautiful new features on this app that blow away past versions. You can now much more easily search the archives, view the upcoming schedule and pick favorites but over recent days the sound quality on the live radio feed has an incredible amount of static and buzz making it impossible to listen to. This has not been fixed as was posted as a response to an earlier review. I came back to the App Store to confirm that I have the latest version and I do. The sound on all my other apps works fine, once again it’s just the Hay House app that has a problem. 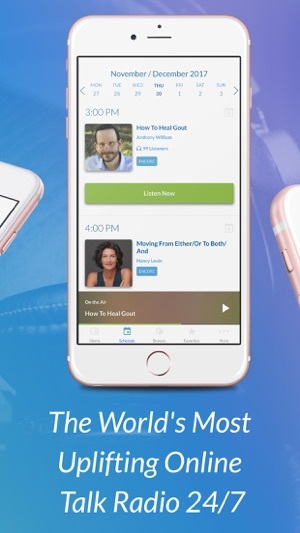 I love the content on Hay House Radio and maybe the fact that it’s a live feed makes it more challenging than the average app, but it does get tiresome to find significant problems with an app you want to use daily. 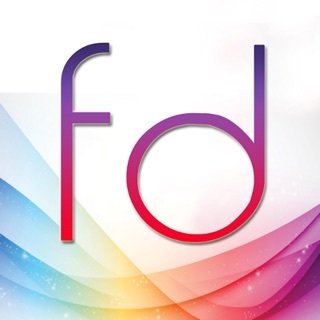 Hi Hello789223, thank you for your feedback! 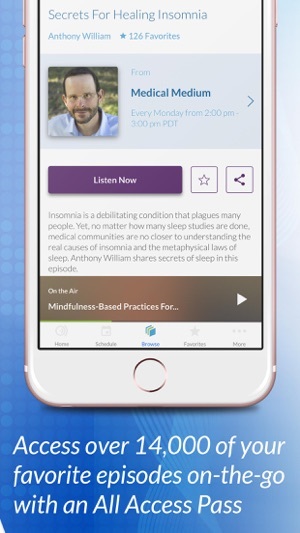 We have been hard at work, and are happy to share that we have released a fully redesigned Hay House Radio mobile app experience for you. The sound issues are resolved, and there are a lot of new features you will love—including access to the Hay House Radio archives! Please go to the AppStore and update your Hay House Radio app to apply this update. 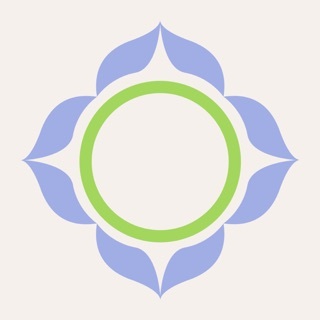 I love the content of HayHouse, 5 stars for that. But the app is clumsy and clunky. I’m being generous with 2 stars. There are a lot of unnecessary “sub-clicks.” For instance, I’ll have 20 minutes free to listen to something. I search for Matt Kahn, then I also have to say if I’m looking for emotional support, spirituality or meditation or lifestyle. And sometimes I get different results than that to choose from. Really confusing, annoying and a waste of time. By that time I’ve used up 5 minutes of time I could have been listening. If they would just make it simple I could get to what I want faster. I’ve tried to navigate it about 8 times now. Just a very unwieldy app to use; it’s not possible to use efficiently right now. Format needs to be re-thought and re-worked. When they do that, I’ll subscribe for 2.99 a month for greater access, but not now.